This 10 year old mannequin can be doing the things that 10 year old children do daily, it's adjustable! 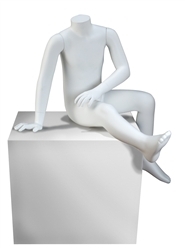 This unisex mannequin can be transformed into boy or girl, perfect for reaching out to those young kids. Completely poseable to any position with hands that can grasp any object.